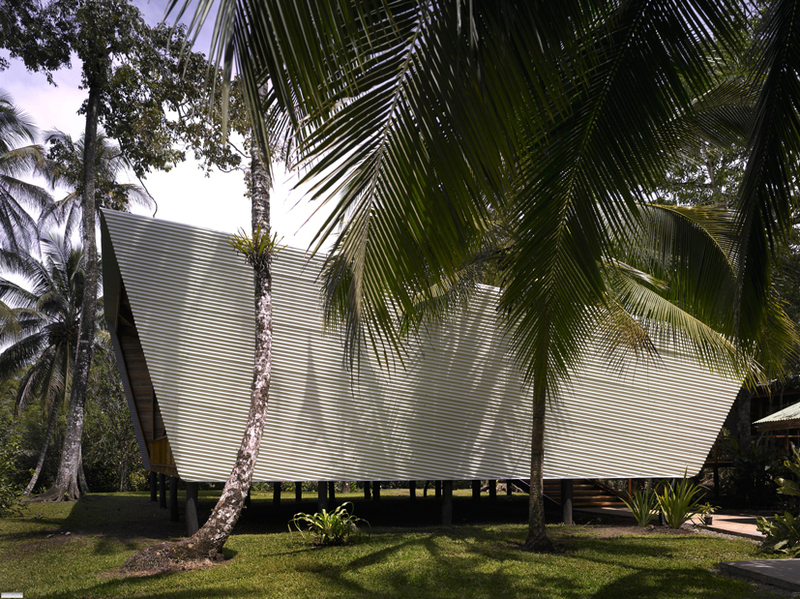 Casa Kiké is an intimate double pavilion for a writer in Cahuita, Costa Rica. 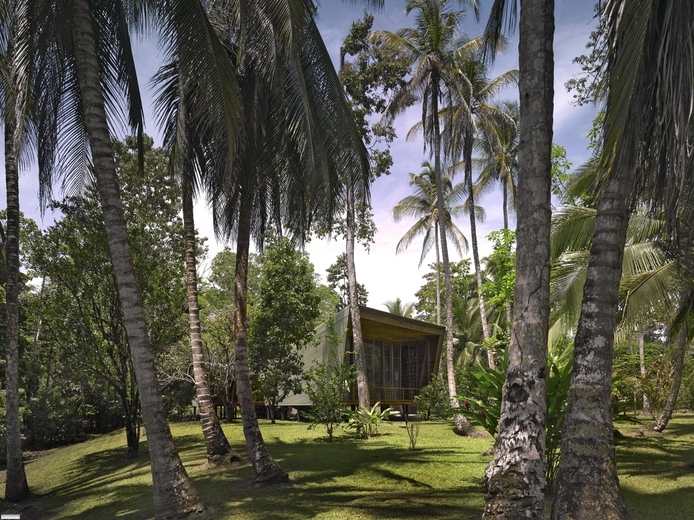 British based Gianni Botsford Architects reappraised the architectural heritage of the region, by giving a modern take on local techniques. The pavilions have a minimal impact on their surrounding, both physically and environmentally. Gianni Botsford also designed the holiday home for sculptor Anish Kapoor in the Bahamas, which I wrote about here. 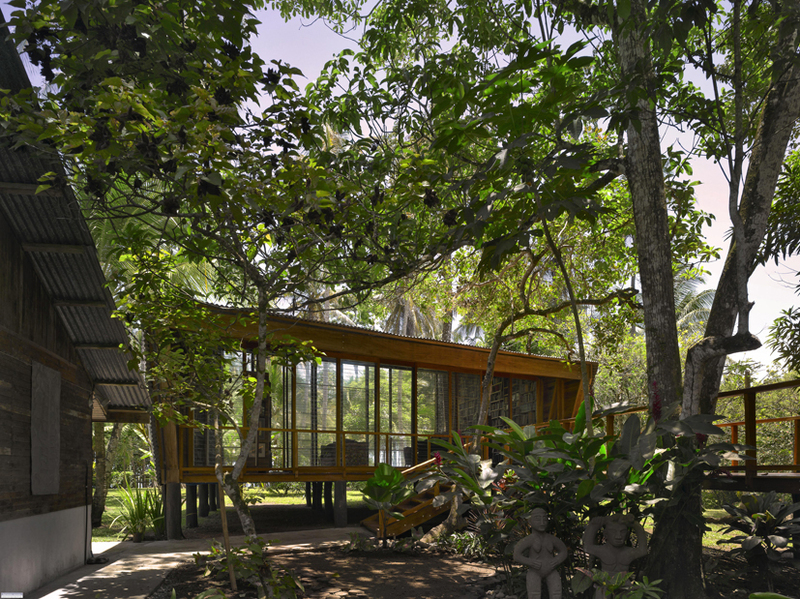 Casa Kiké is built within the grounds of an existing one-storey house. The older house serves as guest quarters and the main kitchen, while the new pavilions are the artist’s main residence. 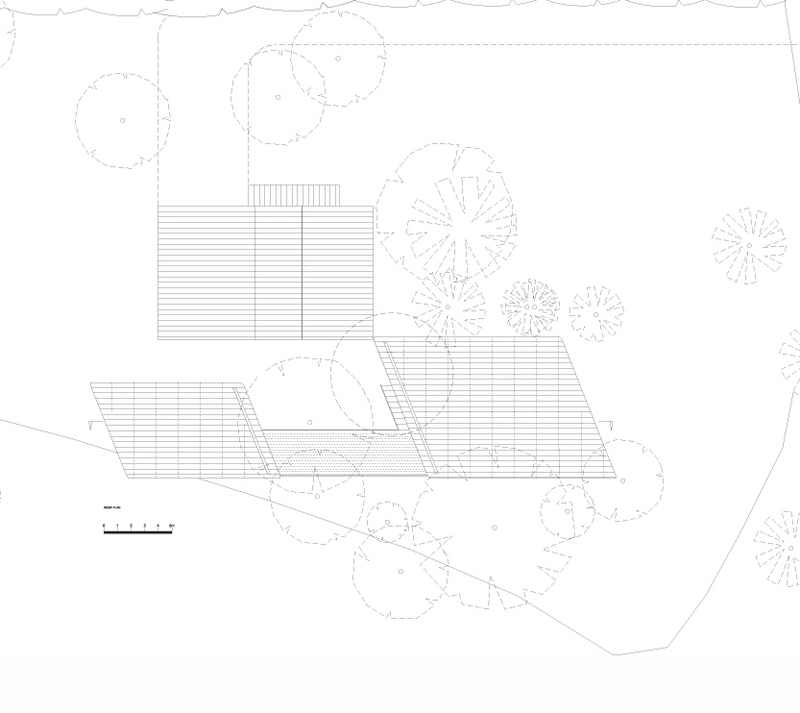 The larger of the two pavilions houses the artist’s studio and contemplation space. 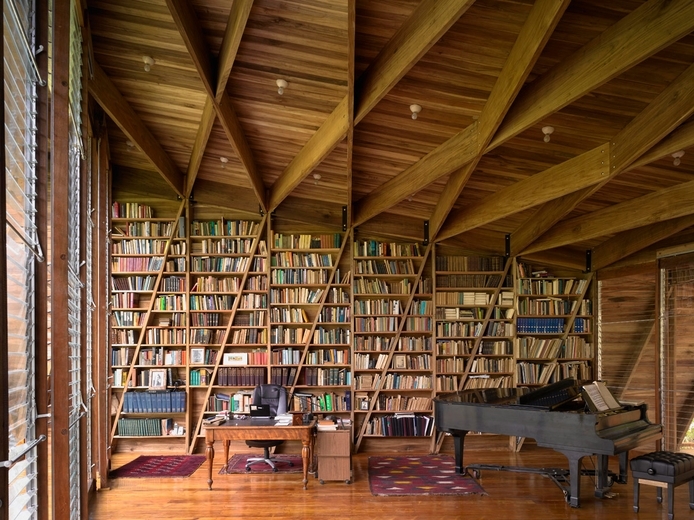 In it the writer’s collection of thousands of books, a writing desk and a grand piano, are kept. 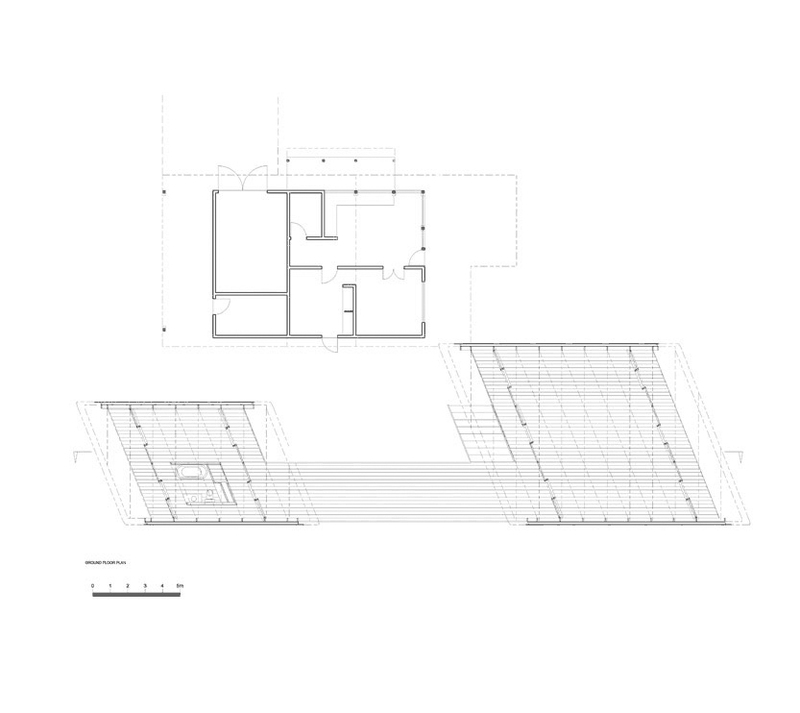 Its single-pitched roof creates a high end elevation with a large glazed facade facing towards the sea. Louvered panels, common in local architecture, allow the entire facade to open letting in the sea breeze. 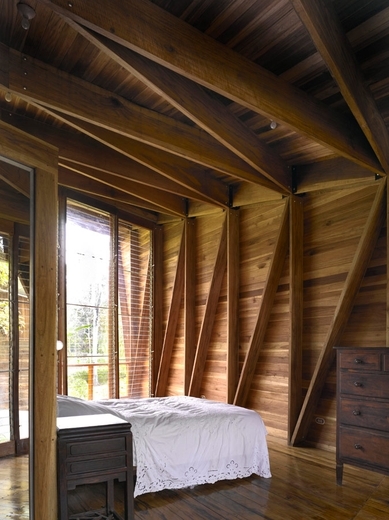 The smaller rear pavilion houses the bedroom and bathroom. It is the same shape but two thirds the size of the larger pavilion. 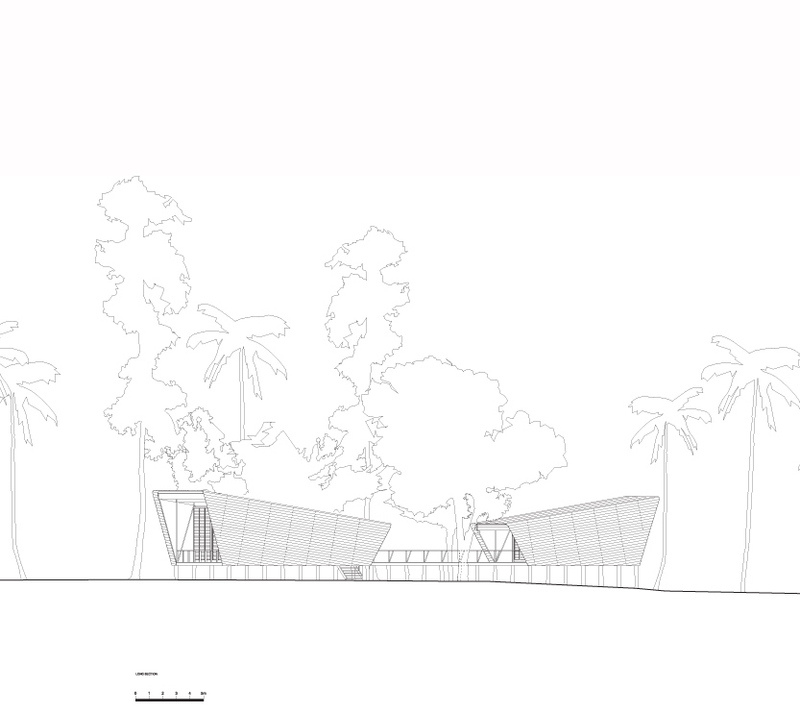 It is orientated so that its highest façade points towards the jungle. The walkway between the two spaces is treated as an outdoor living space, with a small pool and rich vegetation which includes mature avocado, mango and cashew trees. 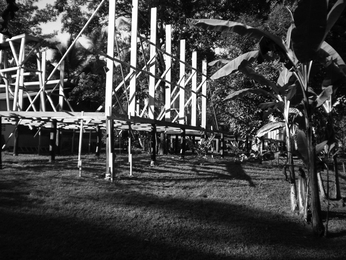 The lightweight structure sits on a timber base raised 1.2 m above the ground on wooden stilts. These rest on small concrete pad foundations, poured into individual pits, as per traditional building techniques. 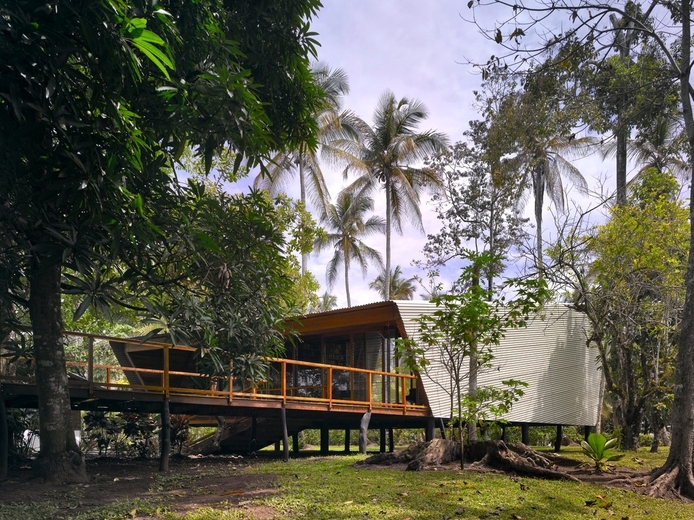 The architect has also taken reference from native building styles and materials, rather than the western-influenced architecture favoured by wealthier Costa Ricans. However, the load-bearing element of the two pavilion buildings is an intricate pattern of diagonal timber beams and columns in an entirely contemporary style. Designed for both structural and aesthetic qualities, the beams are up to 10 m long and 355 mm deep, allowing for an interior with no vertical columns. 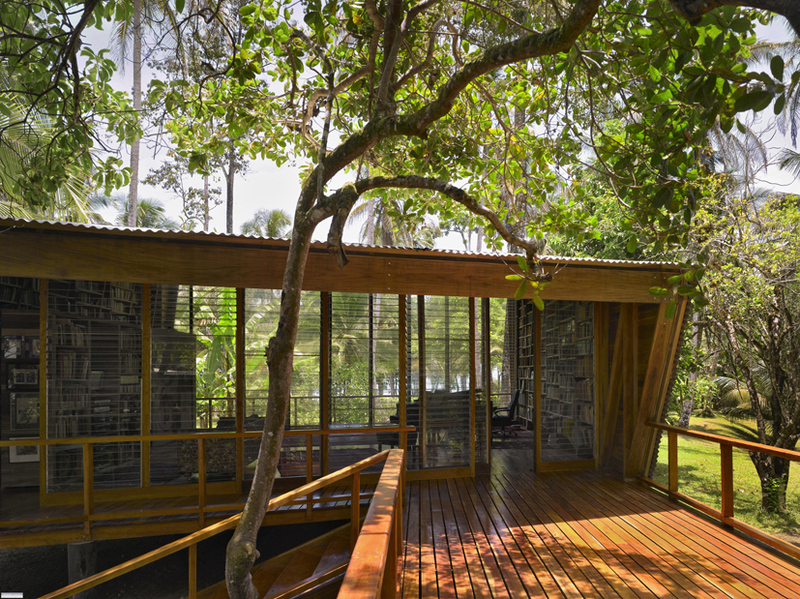 These are all sourced from local hardwoods, Laurel, Cachá and Surá, as is the timber cladding and decking for the raised walkway, which connects the pavilions. 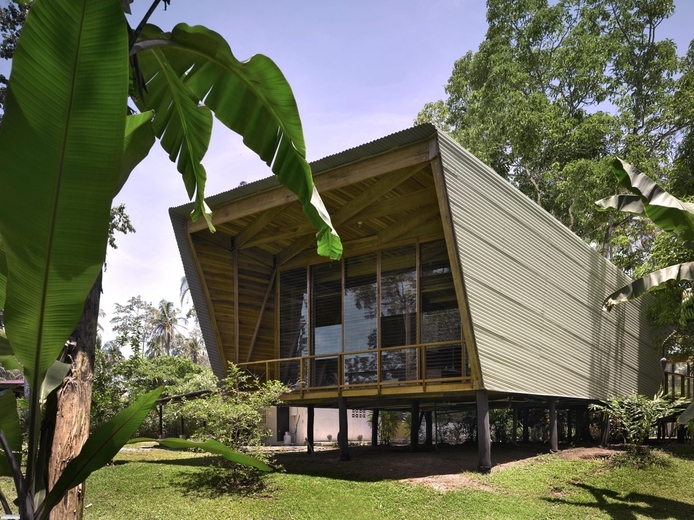 The expertly crafted interior contrasts with the external cladding, which is inexpensive corrugated steel sheeting, as used on many low cost Costa Rican dwellings. This rustic appearance hides a simple yet effective design to ensure comfortable conditions in the pavilions at all times. Beneath the external cladding there is an air gap and a layer of foil backed insulation. This construction reflects heat and allows it to escape via the cavity rather than warming the interior, so making the space habitable throughout even the hottest of days. 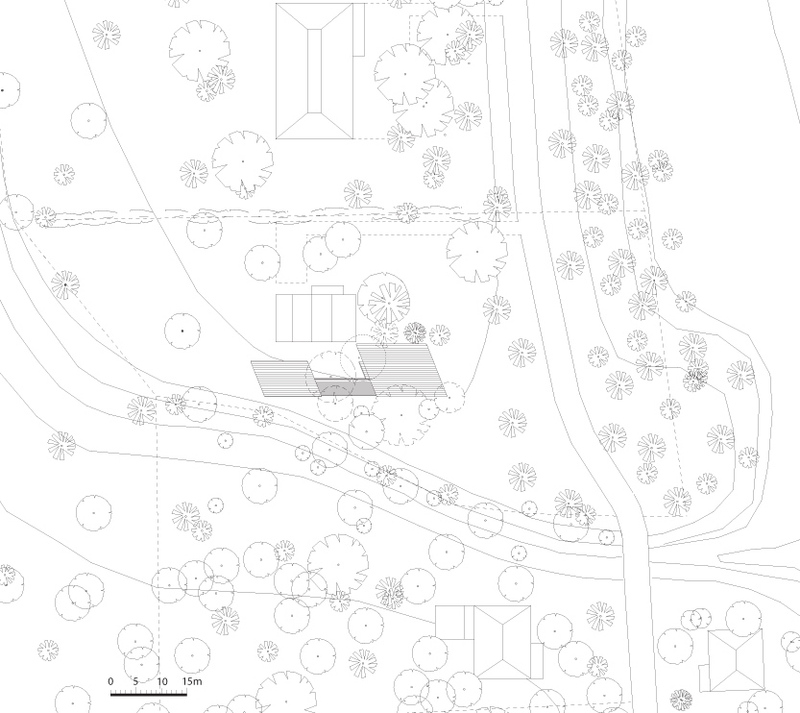 The positioning and orientation of Casa Kiké was arrived at following exploratory design work involving plotting the sun movement, prevailing winds and desired views onto the site. Furthermore, the client insisted that no trees be felled meaning Casa Kiké had to fit between them with the minimum of disturbance. The shape of the two pavilions assists in promoting the best views and ventilation, while keeping the low sunlight out of the interior spaces and also screening them from neighbouring properties. The length of the walkway between the pavilions was also calculated precisely. At twice the length of the main building, it ensures that the smaller pavilion is not in the larger one’s ‘wind shadow so that it benefits from the ocean breeze as much as the main building.